A few days ago, we reported how Jaymes Reed had pulled his creator owned Comics COMICS biography line from Bluewater, amidst allegations and delays of non payment. In reply, Bluewater publisher Darren G Davis stated that he was only publishing the line as a favour and the books were only selling less than 200 copies each through Diamond. Well, it seems that Darren likes them a bit more than that. 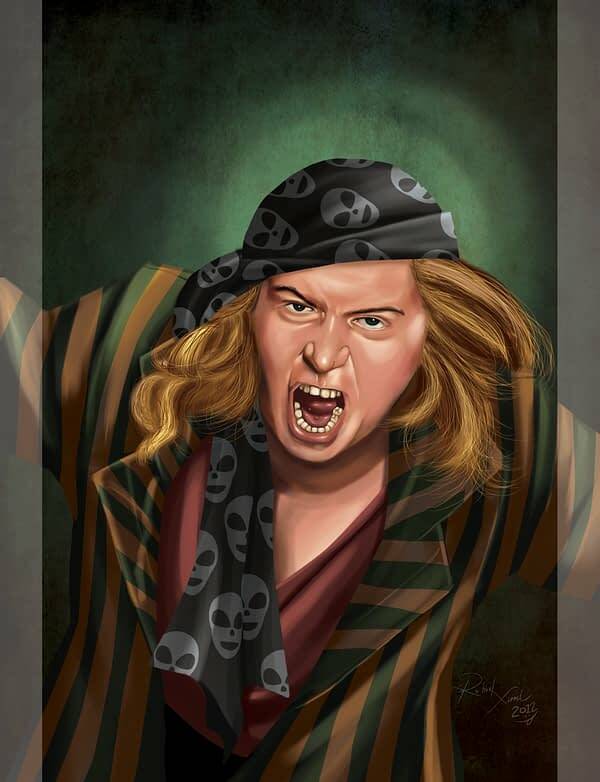 In that after our articles, he approached an artist he’d worked on before who he believed to have painted the cover to the Sam Kinison biographical comic, now pulled from Bluewater and planned to be published by Levity Comics in September. He said that Bluewater were also now planning a biography comic book on Sam Kinison as well and asked if he could use the cover. 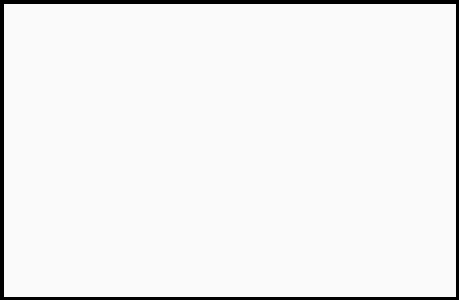 He got the wrong artist, who then emailed Jaymes to ask what was going on. 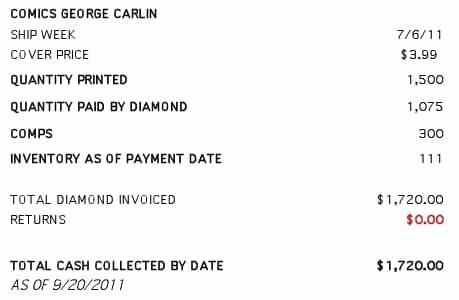 As to the supposed only 200 copies of Jaymes’ books ordered by Diamond, Jaymes shared with me the print breakdown supplied by Bluewater for the George Carlin book. No great shakes, but a lot higher than Darren had indicated. Jaymes told me he received no other paperwork, let alone any payment, for the other books published at Bluewater. We are still moving forward with the series. The writer of the Sam Kinison script works with me on other projects asked me about doing it. The script he did was passed on by Jaymes for Sam Kinison and I told the writer we would do it as the 1st one in the rebranding of the line. He told the writer that the book was not going to be done. The Kinison cover was done under the guise of Bluewater in which I have a contract, so I emailed the cover artist who also has covers for us on Keith Richards and Liz Taylor. As for the George Carlin book – there was only one printing and the rest of the books were shipped to Jaymes. I was the SNL book I was referencing too that was under 200 copies. The 3 Stooges was around 800 copies. These low print numbers really hurt the print runs of the other books we do since we gang run them. Jaymes was well aware of this. Also there were the legal copyright issues with all the books we had to deal with. The numbers are public from Diamond. Once again, I have yet to hear from Jaymes about any of this and I have reached out to him numerous times. This is the last I am talking about this in a public forum, so please do not ask me any more questions about it. Since you are pulling Jaymes’s strings you should have him contact me instead of using this for your benefit for your story. I have done a lot for that guy and feel very slighted on this end. I have done a lot for him professionally and personally. I’m not pulling Jaymes’ strings of course, no more than I am pulling Darren’s. Jaymes and Darren are welcome to talk to each other, but neither seems to be doing so right now. 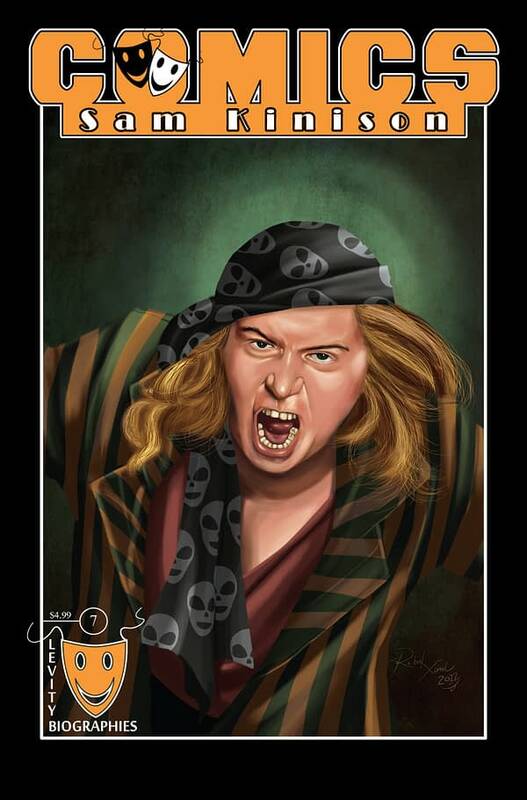 The “rebranding” of the line… or in other words, now that the line has gone, copying its ideas so that no one notices it has left Bluewater, such as a biography on Sam Kinison, and trying to use the same cover that has already been used to promote the now-at-Levity comic. The numbers are not public from Diamond, all you get is an estimate that missed out non-North American sales and subsequent reorders. And while Darren may have done lots for Jaymes professionally and personally, Jaymes still seems to believe he hasn’t been paid, and hasn’t seen the relevant paperwork for his published books.